This giveaway is now closed! Winner will be announced on Friday! I have been trying to be a little greener lately, so I contacted Seventh Generation to see if I could review some of their products for all of you. I was so thrilled when they said yes and even more excited when the two H-U-G-E boxes arrived filled with all these wonderful things!!! It has taken me so long since I received all these wonderful products to write my review because I wanted to use each thing several times before writing my honest review. Cleaning Wipes: Great cleaning power! They hold up well too to scrubbing. With little ones running around making messes, wipes are a life-saver! They are disinfecting wipes too which is even more awesome! I used it on the kids booster chairs to get all the mess and germies off. They also have a great scent - lemongrass and thyme... lovely! Paper Towels: I don't know about you, but we go through a lot of paper towels at our place, so they have to hold up well. To be completely honest, I love the fact that these are 100% recylced, but they aren't as absorbant as my usual ones. They got the job done, but I felt like I used twice as many. All-Purpose Cleaner: Great product! No scent, no harsh chemicals, and super awesome cleaning power! Disinfecting Cleaning Spray: Another product I love!! I used this to clean my dinner table, kitchen counters, and stove top! I really love the fact that it cleans and disinfects... so perfect for those of us with little ones around! Disinfecting Bathroom Cleaner: Super great product. The best part is that it comes out of the spray bottle in a foam!! It's perfect because when I spray it on the shower walls... it stays put! It doesn't just drip down the wall. PLUS... you can let the foam sit on your sink or your tub for a couple minutes and it really penetrates those tough stains! I'm totally buying another bottle when mine runs out! Baby Laundry Detergent: It gets the job done. My little ones (as I stated before) tend to make big messes, not little ones... and their clothes definitely show it! All my stains came out! Plus, it is formulated for baby's which makes it safe for the kiddos!! Reusable Bag: Who doesn't love these? So, there is my review of the great products I received. Here are a couple of the other things they have to offer. Once you visit their site, make sure to sign up to become a member. It's free and it gives you access to coupons for their products! Plus, you can ask and get answers to questions about "going green" and learn about all of the great causes that their company supports! 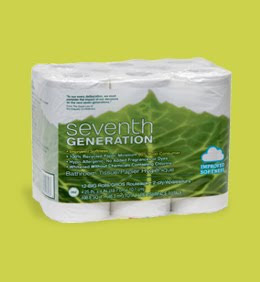 Seventh Generation products are also available at local retailers, check yours to see if they carry this brand! Want to win one of these sets for yourself??? 2 more entries: Blog about this giveaway, please leave me the link to your blog post. **Please leave a seperate comment for each entry! I will check to see that you are a follower, a fan, or have blogged. All entries must be received by Midnight PST on September 1, 2010. I would buy the Disinfecting cleaning spray. Why - because I love things to be clean and germ free. Also because our dog tends to love my little boys toys. I would love to try both kinds of the Natural Hand Wash, this really sounds great! With having little ones around, we are always washing our hands it seems and this would be perfect for around the house, I would definitely purchase this! 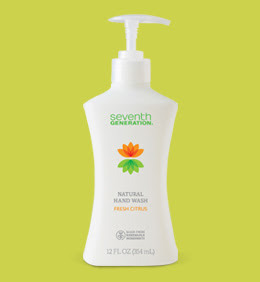 I would like to buy the Hand Wash in Just Clean because I'm looking for a more natural hand soap. Public follower of KdBuggie blog. Fan of KdBuggie on facebook. I'd like their disinfecting spray. I'd definitely buy the baby laundry liquid. I find it interesting (and disturbing!) that just by switching to this product, the US could save 466,000 barrels of oil! I wrote a post about your amazing web site and blog. I also mentioned the giveaway. You're going to laugh but I really like the 100% recycled toilet paper! We actually use it already and it's just as soft and gentle as the other stuff plus the price isn't bad at all! I really want to try all of the other products but haven't been able to find many of them. This will be a great chance to try almost all of them! I am a follower on your Blog (GFC). Just realized what GFC stands for =) Thanks Google! Ha ha! I would like to buy their diapers! OMG!!! I have always wanted to try these products, but living in Brazil now...i haven't found them. I have had my eyes on the training pants!! Gotta have them!!! I am a new fan on FB! I blogged about said giveaway! I would love to try the all purpose cleaner, currently I use their dish washing soap in lavender and I use the Method cleaner you can get at Target but I really like their message so really I would try just about any of their products. I would love to try the hand wash, I wash my hand so much during the day and the get all dry and itchy because the wash I use is so strong. So I would love to see if this wash could be gentler on my hands while at the same time kill the germs. I would love to try the disinfectant spray. Especially since germ season is on it's way! I like your blog on Facebook as Lydia Bruno. I'd like the Botanical Disinfectants cause Flu season is coming. I'd like the Baby Laundry Liquid Detergent because when my lil bean arrives I'm going to want to wash her clothes seperately and to know the detergent is safe for her skin! I'd love to try the disinfectant multi surface cleaner! Would love to try the disinfectant spray so I could get all ready for cold and flu season. 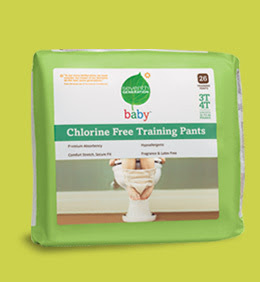 I'd love to try their Chlorine Free Baby Diapers because I want a better alternative for my 6 month old. I'm just afraid I'd buy them and not like them. I would love to try their laundry detergent! I'd love to try a green laundry detergent! I'm interested in their laundry products... especially the fabric softener, since I make my own detergent. I went to their site and would love the non toxic, chemical free diapers for my little Lily's bum bum. I also would like to try their baby liquid laundry. My little one has sensitive skin and that would help out greatly! I am now a fan of your facebook page! I like KdBuggie Boutique on Facebook! : ) what a useful (very useful) giveaway...I luv this...because heck ya I would use all of it lol! the disinfectant cleaning spray....could possibly be my best friend! I would definately try the chlorine free diapers! I think this would be what we use most areound here. And lately I have been taking a real close look at Natural & organic products for my kids sake. I would like to try the Recycled Trash Bags, because you always need trash bags, and I think it's a cool idea! Thank you for the giveaway! I would like to try the Baby Liquid Laundry Soap. I have two new Grandsons due at the end of the year. I love their baby liquid laundry detergent! It works great on my little guys sensitive skin! Just realized I didn't do the mandatory entry. I would get the Cencentrated Baby Soap. I already use this product and LOVE it!